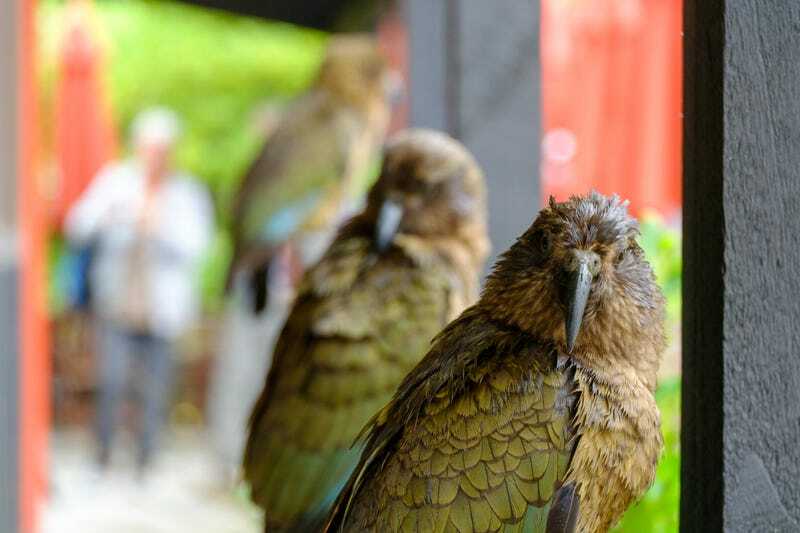 This is a gang of Keas, the world’s only breed of Alpine Parrot, and living in the Southern Alps of New Zealand. They are cheeky, smart and very curious and are considered as the “Clowns of the mountains”. Less than 5000 survive in the wild (though no one knows how much), and these 3 were shielding from the rain (should I say storm) in Arthur’s Pass. They are kind of pests to the residents, but they’re really entertaining for us tourists. They are known to steal food and objects (there’s a story about a tourist from Scotland whose passport was stolen by a Kea in Fiordland) and to try to eat the rubber of you car. And apparently, young ones, are kind of fond of car surfing (and sometime die because of it). Picture was taken on my regular X-A1 coupled to a XC50-230mm lens and a plastic bag (held on the lens with its hood) to protect the camera from the pouring rain and wind.